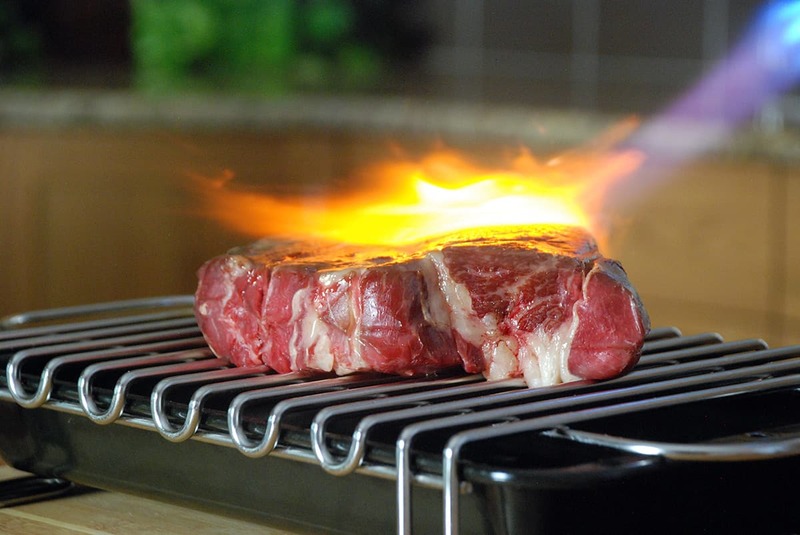 This article will focus on the use of a torch to provide the finishing sear on sous vide dishes. The TS8000 High Intensity Trigger Start Torch is available at Amazon for around $40.00 and at Home Depot for about $40.00. The torch is available at both retailers included in a "kit" which also includes a 14.1 oz. Map-Pro-filled cylinder. The Searzall is now available on Amazon for $75. It has been quite popular and is rated very highly by those who have used it. This is actually a two-part torch recommendation. First, I believe the Bernzomatic TS8000 is the best torch for searing sous vide dishes. It is relatively easy to use and provides more heat than the other options which will allow you to sear dishes quicker. Another reason for selecting the TS8000 torch is because it is the one recommended to be used with the Searzall. If you are a serious sous vider, who prefers to finish their sous vide dishes using a torch, it is likely that you will want to try out the Searzall at some point in the future. You can begin immediately using the Bernzomatic TS8000 torch to get a satisfactory sear on your sous vide dishes. Then at a later date your can pick up the Searzall Torch Attachment , connect it to your TS8000, and raise your game to the next level.